Colton Huffman of Churchville, Va., is the first participant to complete the Augusta County Library’s literacy program, 1,000 Books Before Kindergarten. Initiated last fall, the 10KB4K program encourages families to read with their children in preparation of school. The program is endorsed by the Augusta County Public Schools. Forty-three percent of children in America are not ready when they enter kindergarten. Because learning language becomes harder after the age of four, these children may or may not be able to catch-up with their peers by the end of kindergarten. Yet, teaching grammar, phonics and vocabulary to children can be easily accomplished if parents read to their child regularly before the start of school. The Huffman family found that they were able to reach a total of 1,000 books by reading an average three books or 15 minutes a day with Colton. Like most preschoolers, Colton loves books—especially those about tractors—and has favorites he asks for again and again. Sharing books with children builds a positive association with books and creates family bonds. 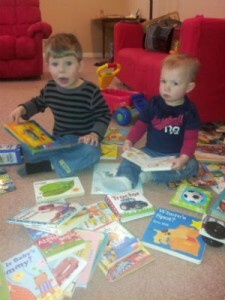 Colton’s little brother Travis now joins reading time and will soon complete his 1,000 Books certificate. Children age birth to five can register to participate in the 10KB4K program at any Augusta County Library location. There is no charge for the program. For additional information contact the library at 540-885-3961 or visitwww.augustacountylibrary.org.